In the course of my family research I have compiled a number of surname lists in Trove and while these are very useful for revisiting events, there is no way in Trove to search within each list to locate either a person, date or event. As I have created lists within Trove, I have corrected the OCR then copied the corrected text from the newspaper article into the Note field for each item on my list. This means I have the full text without needing to search for it again when I want to build a family timeline or write a blog post. At this stage there is no method of exporting lists from Trove so that they can be modified and searched. Enter my good friend Evernote. Why did this not occur to me earlier? I've used the web clipper in many other contexts but never thought to use it for lists. 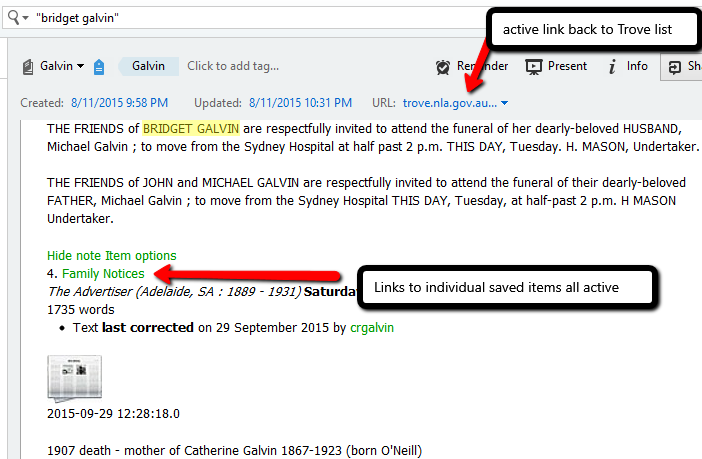 Individual items in Trove can be saved in a variety of formats but for lists the only current option is pdf. Using the web clipper I've chosen Simplified article and saved. 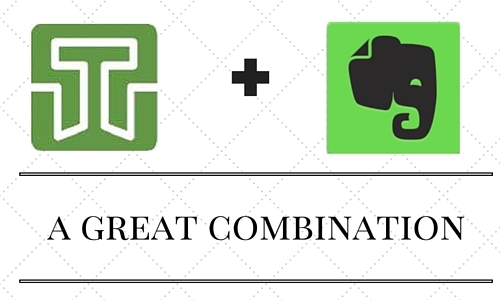 Now my entire list is searchable and able to be edited in Evernote. If I update the list in Trove, I can simply repeat the process and delete the earlier note. So when I search in Evernote for "bridget galvin" her name is highlighted within the Galvin list. The link back to the list in Trove is active as are all the individual links embedded in the list. All the source citations are embedded too. Similarly, I can search using a particular year, e.g 1907, if I want to locate all the events that were published in that year. Some lists I have on Trove are private. Now they are in Evernote, there is no need for me to log in to Trove again to retrieve information from those private lists. Trove and Evernote, a great combination.